Intrepid Control Systems » neoOBD 2 PRO neoOBD 2 PRO | Intrepid Control Systems, Inc.
You know IoT, and Intrepid knows how to get automotive data. The neoOBD 2 Pro is the key to combining these knowledge areas. Getting automotive data in a form ready for IoT has never been easier. The neoOBD 2 PRO is designed to be an open platform wireless OBD adapter. It is equipped with programmable Wi-Fi and Bluetooth BLE modules, and also has a Bluetooth Classic SPP module. You have complete access to raw vehicle network data within these modules, via secure APIs that interface to Intrepid’s proven CAN, LIN, and Ethernet drivers. You have the ability to provide the vehicle network data over Wi-Fi, Bluetooth BLE, and Bluetooth Classic SPP to other wireless and mobile devices. The SimpleLink™ Wi-Fi® CC3220SF Wi-Fi module inside the neoOBD 2 PRO is compatible with popular IoT platforms, such as AWS, Microsoft Azure IoT, IBM Watson IoT, and any other platforms and servers based on secure protocols such as HTTPS, SSL/TLS and MQTT. Examples and tutorials are available to help you get started with your next automotive IoT project. 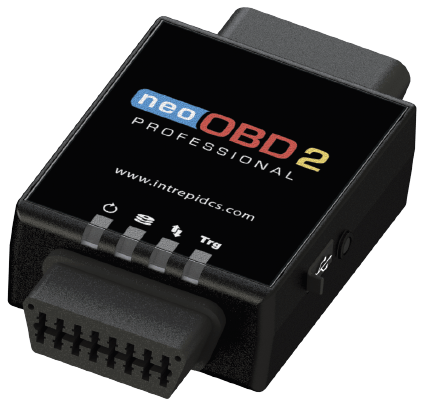 Intrepid’s Vehicle Spy software fully supports the neoOBD 2 PRO. With Vehicle Spy, users can monitor and transmit on all neoOBD 2 PRO networks simultaneously. Vehicle Spy is required to configure standalone mode. Users can take advantage of the powerful interface to load databases and to write and debug scripts before downloading them to the device. 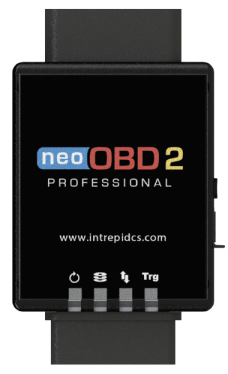 In addition to working as a PC interface, the neoOBD 2 PRO can operate in standalone mode. It can run real-time scripts, log data to internal flash memory, and simulate ECUs and gateways. These features also make it possible to run a script to reflash ECUs using data from flash memory.